I have quite a few recipes in line that are waiting to be shared with all of you, and this one I have been very excited about! 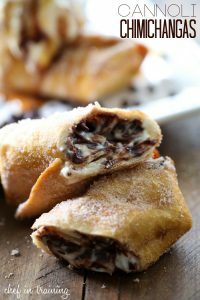 Let me introduce you to Cannoli Chimichangas. This recipe for Cannoli Chimichangas is phenomenal. I mean, really. The insides of cannolis, deep fried and covered in cocoa sugar. What is not to love about this dessert?! Top these warm chimichangas with some ice cream and you have a match made in heaven. Cannoli filling, deep fried and coated in cocoa sugar… what's not to love?! Heat oil to 360 degrees F in medium sauce pan. Beat cream cheese, ricotta cheese and sugar together in small mixing bowl. Add sour cream and vanilla and mix thoroughly. Stir in chocolate chips. Place ⅙ of the mixture in the middle of a tortilla and fold buritto style. Secure with toothpicks and fry for 2 to three minutes flipping half way until golden brown on outsides. Roll in coco sugar coating mixture and immediately serve with ice cream. Drizzle with hot fude and carmel. I made these, they were amzaing and so fast! My family loved them! Thanks for the wonderful recipes! I love your site! DOH........ Self control out the window! I can't resist, but will try to wait until next time my boys visit with the kids. Thanks. Can these be made ahead and reheated? is ricotta cheese necessary or can i use something else?